Hawaii Lt. Governor Brian Schatz today announced that AeroVironment has been selected to help lead the way to a cleaner transportation future through an $820,000 contract from the Hawaii EV Ready Grants Program. The contract will fund the deployment of up to 320 AeroVironment 240-volt electric vehicle (EV) charging docks throughout the islands. Once deployment is completed, Hawaii will have one of the nation’s first statewide public charging networks supporting electric vehicle drivers. 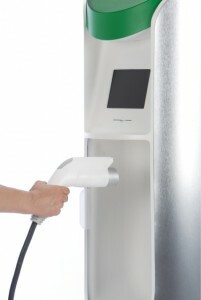 AeroVironment (AV), the official home charging-dock provider for the Nissan LEAFÒ and co-developer of the first modern-day electric vehicle, the GM Impact, will partner with Hawaiian Electric Company (HECO) to design and build public and semi-private charging stations at convenient locations for electric vehicle owners, including high-rise buildings, resorts and rental car facilities. AeroVironment’s charging docks, including the two-port or four-port EVSE-RS+ and EVSE-CS (commercial) dock, will be strategically located throughout Oahu, Hawaii Island, Maui, and Kauai to offer drivers a practical, safe and reliable EV charging experience. AeroVironment has installed more than 1,000 charging docks in more than 300 communities across 18 states since November 2010. The State of Hawaii is offering a rebate of up to $500 for installing charging docks through its Hawaii EV Ready Rebate Program. Customers who purchase an EV are also eligible for a state rebate of up to $4,500. In combination with the Hawaii EV Ready Grant Program and other development efforts, the rebates aim to establish the state as a leader in the clean transportation movement. The Hawaii Natural Energy Institute (HNEI), University of Hawaii at Manoa will work with AeroVironment and Hawaiian Electric to collect data from chargers to analyze the impact of EVs and associated infrastructure on the power distribution grid. AeroVironment has been working on clean transportation programs in Hawaii for more than a decade, beginning with deployment of fast charging stations for passenger EVs in the early 2000s. AeroVironment also established world altitude records with its solar-electric, unmanned aircraft systems at the U.S. Navy Pacific Missile Range Facility at Barking Sands on Kauai. AV is a technology solutions provider that designs, develops, produces and supports an advanced portfolio of electric transportation solutions and electric-powered Unmanned Aircraft Systems (UAS). AV’s comprehensive EV charging solutions include EV home charging, public charging, fast charging, data collection, grid-integrated communications and complete installation, training and support services for consumers, automakers, utilities, government agencies and businesses. AV’s industrial fast charging systems support thousands of electric materials handling vehicles in mission-critical supply chains for Fortune 500 enterprises. AV’s power cycling and test systems provide EV developers and EV battery manufacturers with market-leading simulation and cycling capabilities. Agencies of the U.S. Department of Defense and allied military services use the company’s battery-powered, hand-launched unmanned aircraft systems to provide situational awareness to tactical operating units through real-time, airborne reconnaissance, surveillance and communication.